Sideshow Collectibles is proud to present R2-Q5 Imperial Astromech Droid Sixth Scale Figure. Wow, look at that! My husband and son would definitely want him. This figure looks super cool. I know there is so much Star Wars hype lately but in all honesty...I love it! I say bring it on. 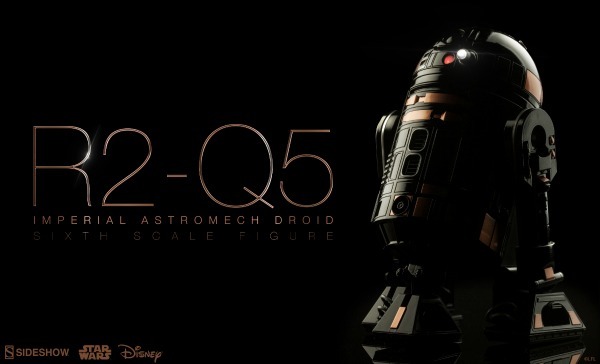 R2-Q5 has a black and bronze finish. It looks sharp. It includes retractable tripedal treads, hinged panels, and a light up dome. This would look great in someone's collection. This figure goes for $139.99. Perfect for a holiday gift for any Star Wars fan. Sideshow Collectibles has a fun even going on called Spooktacular and there are prizes to be won. Check out their page here. I hope to one day buy one of their cool figures. They have a wide variety of figures for any fandom. Do you know any Star Wars fans?